Today’s post is a guest post from Evgenia Fraschetti of Amber Regina. I’m very excited to introduce her to you, and so thankful that she took the time out of her very busy schedule (she just became a new Mom!) to share all these interesting amber facts with us. I grew up in the Baltic and my Mom was always wearing amber jewelry, but there is plenty I didn’t know – I learned a lot of new things here. Amber is a fascinating stone. First of all, it is not a stone. Amber is a fossilized resin of certain pine trees that grew millions of years ago. To be called “amber”, the substance must be at least 10 million years old. If it is younger, it is called “copal”. So when wearing amber, you wear a piece of natural history, and that’s not just the resin itself – often amber has inclusions (parts of plants and insects) that were trapped in the resin back in the Miocene Epoch. While amber is found on almost all continents (there’s amber even in Alaska, and in small amounts in Mexico and the Dominican Republic), 90% of the world’s amber deposits are found around the Baltic sea, mined near Kaliningrad (Russia) about 60 feet underground. Not all amber is suitable for jewelry, but the Baltic amber is, and the most fascinating beads are handcrafted in Lithuania and Poland, the two oldest centers of amber jewelry making. The color of amber ranges from white to almost black (when it has debris and other inclusions). It can be fully translucent or opaque. Mexican amber has a characteristic translucent cognac color. Dominican amber can be transparent yellow, honey, cognac, green and even blue. It also has the most unusual inclusions such as spiders, lizards, frogs, different plants, which are sought after by collectors and museums and cost a fortune. So if you come across a big chunk of amber with a surprisingly large insect or a reptile for only $100-$300, it is a fake. About 5% of the Baltic amber also has inclusions, mainly small parts of, or whole, insects and tiny pieces of plants, which makes for veryinteresting-looking jewelry pieces. Prices for those vary between $7.5 and $11 per gram. Also, Baltic amber has the widest range of colors and it is the only amber that comes in butterscotch, yolk and white colors. Green varieties are rare, and natural green color is normally very light, like olive oil. When you see bubbles and discs in amber jewelry, it means that the amber was treated with heat and steam. There’s nothing wrong with this; the technique has been in practice for hundreds of years to create different varieties of visual effects. 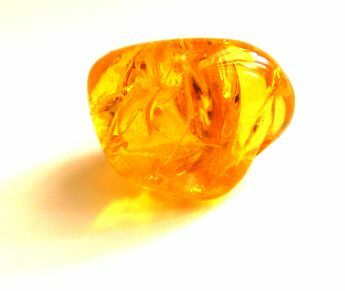 Nicknamed “a piece of the sun”, “sun light”, “golden gem of the ages”, “protection against all diseases”, “precious jewel” in different cultures, amber has long been associated with numerous healing qualities. In Europe it has been used primarily for pain relief when worn directly on skin. It soothes tooth pain, headaches and is believed to ward of nervous afflictions. 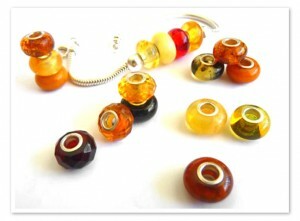 During the late 1960s, it was a widespread belief that wearing amber beads around the throat protected it from diseases. 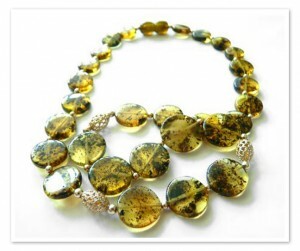 It was believed that the strong electrical properties of amber resulted in a protective band forming around the throat. Even today in many areas of the Baltic, amber earrings and necklaces are worn when one has a headache or a throat ailment. 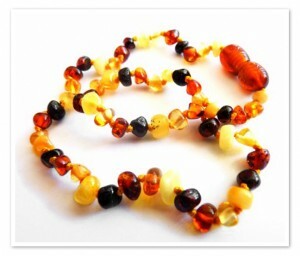 Baby teething necklaces made out of amber beads are a popular and often efficient way to soothe tooth pain. They are supposed to be worn next to the skin, either around the baby’s neck, ankles or wrists during daytime. In the civilizations of the early Greeks and Romans, amber was so revered it was available only to nobility. Ladies of the Roman court desired it for its brilliant hue and for the protection from evil spells. It was more expensive than gold and the golden color in particular was appreciated. Even if amber is not as expensive as gold these days, it is not cheap at all. The least expensive varieties such as amber “chips” start from at least 45 cents per gram. The most expensive type of amber is butterscotch Royal white, cherry and cognac beads carved as ideally round balls (between $8 and$12 retail value per gram). To produce this shape, a lot of amber leftover remains, which increases the price of the finished product. Amber is a soft gem, it is therefore easily faceted (by hand only). 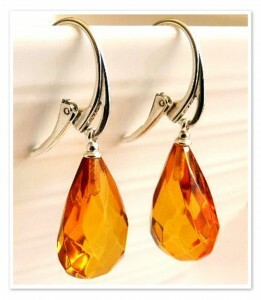 Faceted amber has the look of a precious gem. It is shiny, gorgeous, very feminine and unique. Put a few drops of alcohol on the surface of the stone and wait till it evaporates. If the surface gets tacky and you see your fingerprints left on it, then this amber is fake. Alcohol evaporates on genuine amber. Copal (immature tree resin, often mixed up with real amber) and plastic fake amber do not hold up to solvents. Take a pin or a needle and carefully scratch the stone. This is recommended to be done on the back of amber bead or on its invisible part. If the amber is real, it will be scratched (amber is quite a gentle stone); if not, it will remain undamaged. Fill a medium size pot with water, add seven teaspoons of salt, let it dissolve in the water and stir every 30 minutes for some time. As the salt solution has a high gravity, the real amber will come out and start floating on the surface, while the fake one will go down and will begin sinking. 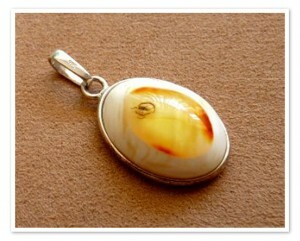 If your amber is set in solid sterling silver, it will sink as silver is heavier than water. 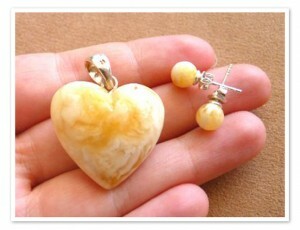 Amber jewelry is very comfortable to wear. Since amber is an organic substance, it takes on the temperature of your body; it doesn’t warm up in hot weather and doesn’t cool down in the cold. 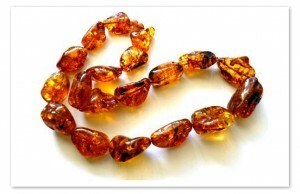 It is very light, and even the chunkiest amber necklaces weigh only about 150-200 grams (roughly 5 – 7 oz). Amber doesn’t need a lot of care. When not worn, amber jewelry must be kept in a velvet or silk pouch, separate from other jewelry, especially hard gems and those containing metallic parts. Amber is easily scratched and thus might lose its luster when not stored properly. It needs to be cleaned with water and once in a while polished with a soft fabric and a drop of olive oil. Take care of your amber jewelry and its warm sunny color and natural beauty will last for generations! Amber Regina is a small company founded by me, Evgenia Fraschetti, in 2011. I am a Russian by birth, married to an Italian man who is a great help in my business. “Regina” means “queen” in Italian. This way I always keep a piece of Italy – the most inspiring and fascinating country – in my everyday duties. 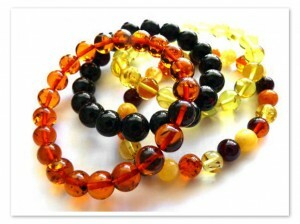 My jewelry is made out of natural Baltic amber beads handcrafted by Lithuanian and Polish artisans. I am constantly looking for new designs and ideas and introducing more varieties of jewelry every year. In my online shop www.amberregina.com you will find not only jewelry, but also unique amber fossils with insects, amber nuggets, charm beads as well as a selection of amber baby teething necklaces.